He added that GTA polls are unlikely to be announced by the State Election Commission, as GNLF had moved the Calcutta High Court in 2012, claiming that the very formation of the body was unconstitutional. The case is pending in court. “Without elections, a new body could be formed if Bimal Gurung (GJM chief) was to be given an extension. 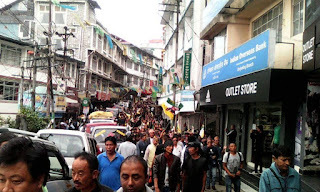 But it is unlikely that the GJM will want a new GTA to be formed because then its demand for a separate Gorkhaland becomes irrelevant,” said Zimba. GJM spokesperson Binay Tamang, meanwhile, had moved Supreme Court in May, alleging that the state government had breached the terms of the GTA agreement by not handing over administrative powers to it. He had also alleged incessant interference by the Mamata government in the running of the GTA. While GJM leaders have decided to quit the GTA citing the issue of “forced imposition of Bengali language” on the hills, GNLF’s position has taken a U-turn since Chief Minister Mamata Banerjee’s visit to the hills. But on Wednesday, he claimed that the chief minister had clarified that studying Bengali will be optional for hill students. “GNLF has been vehemently opposed to Bengali being made mandatory in schools in the hills… Language is a sensitive issue here and is a matter of our identity. We had taken this position in the light of great confusion because the state education minister, and indeed the chief minister, had said earlier that it will be mandatory across the state. But in Mirik, she unequivocally clarified that it will be optional in the hills. The GJM agitating in light of her statement is unacceptable,” said Zimba.